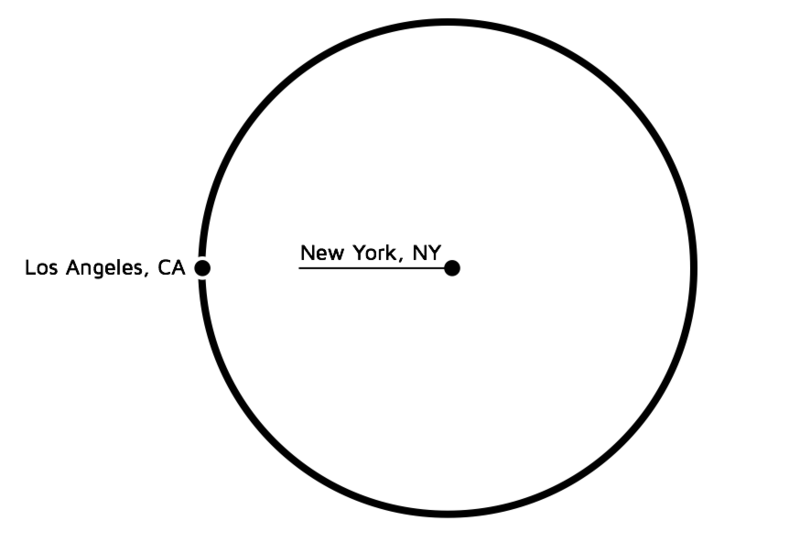 New York was sitting in the center of this circle and Los Angeles was to be found somewhere along the circumference (preferably on the west side of the circle). This is how the US looks like in my mind. I tried to add as many details as possible from my memory. CAUTION! The following map was sketched from my own memory it is not accurate and, as you’ll read below, some bits of it are plain wrong! Actually, I cannot spot any error. 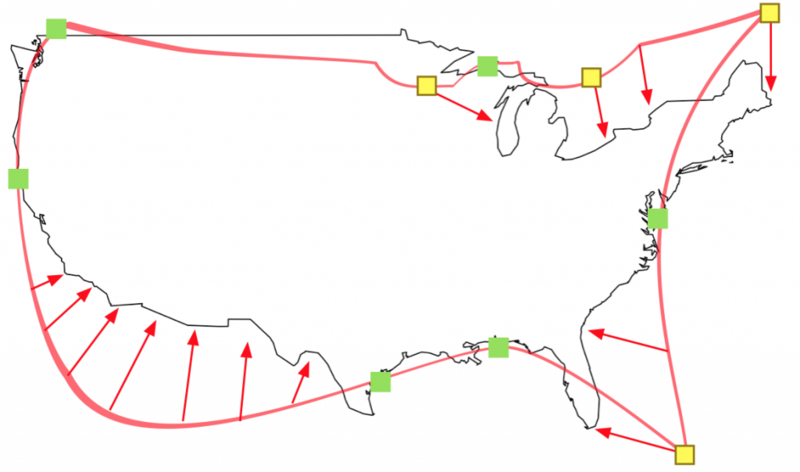 This is how the map looks like in my mind: it’s my own -most accurate- depiction of US geography. So, to spot the errors I have to turn to real data. Using the maps library for R, I’m comparing my own US shape with the actual US shape. The red outline is my mental model of US shape. Green squares represent a topological match, red arrows depict the mismatch and the yellow square is used to represent a misplaced (but correct) topological feature. Anyways, my overall mental model is so distorted that pinpointing cities on it would make no sense. 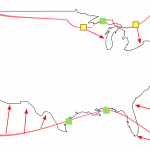 So I tried to use the real US geography as a guide for mapping the cities. Again, this map is wrong! I’ve tried to map cities on it from my own memory. 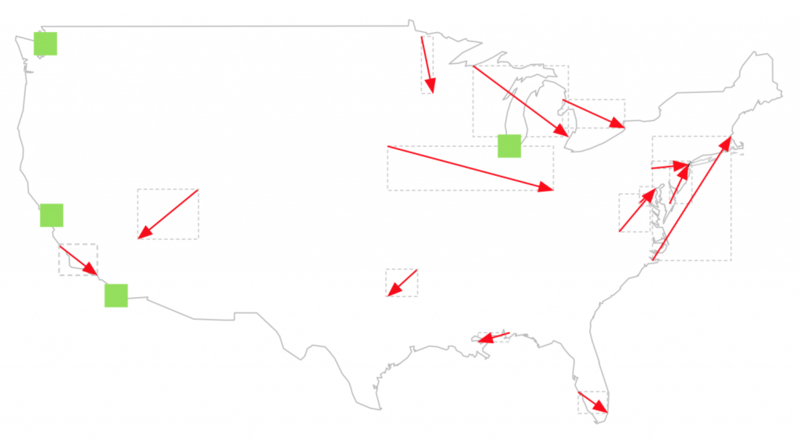 Green squares represent cities that were mapped in the correct location. Red arrows point from the mental to the actual location of the city. I did a very poor job. My plan was to calculate the average error (i.e. the average displacement error between mental and actual location) but that’s way too embarrassing! 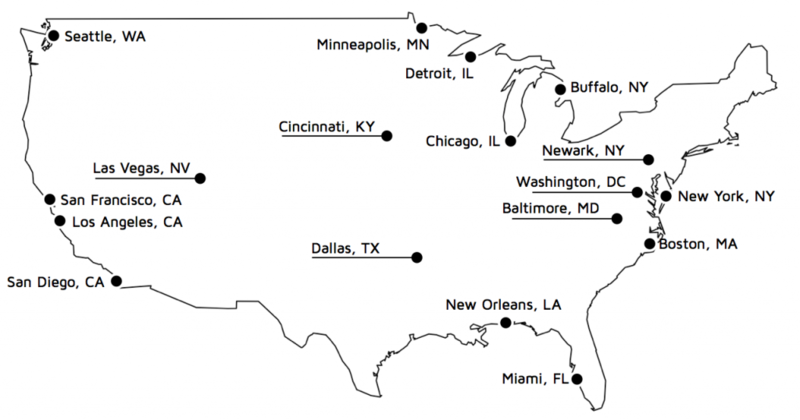 Probably the most embarrassing error is my inability to pinpoint cities relative to each others (i.e. Does Detroit seats on the west or east of Chicago?). Mental models – the sloppy engine that makes us smart! We routinely use mental models for solving problems (or perform simple to complex actions) in our everyday life. The brain harnesses a minimum amount of information to quickly build a compact, flexible and useful knowledge about complex objects (e.g. events, procedures, locations …) .